Altronix is showcasing three new 8-port NetWay Midspans at ISC West. The NetWay8BT provides up to 90W power per port (480W total) for the most demanding Hi-PoE IEEE 802.3bt compliant devices, such as multi-sensor megapixel cameras or PoE lighting. For devices demanding power up to 60W each, Altronix now offers the NetWay8GP, providing up to 60W of power across all 8 ports (480W total). 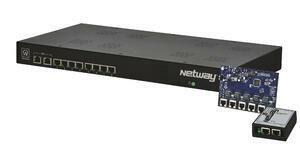 The NetWay8GL provides 60W on any designated port up to 240W total across the unit’s 8-ports. The new NetWay 8-port Midspans feature: a 1U rack enclosure; 10/100/1000 Mbps data rates at distances up to 100m; and an integral battery charger for applications requiring backup. The NetWay8GP and NetWay8GL also feature embedded Altronix LINQ™ Technology to monitor, control and report power and diagnostics from anywhere. Altronix is also showcasing the new NetWay XTG PoE+ Gigabit Ethernet Repeater that extends data (video) up to 100m with a maximum possible range of up to 600m using multiple units. The unit is powered by the PoE/PoE+ it passes through. Additionally, Altronix introduced the NetWay5B 5-Port Ethernet Switch that allows up to four IP devices to be connected to the headend using a single CAT6 Ethernet cable, and is powered via PoE or any 12VDC or 24VDC source. Designed to be mounted in any Altronix enclosure, including their industry renowned line of Trove™ Access and Power Integration Solutions, this new NetWay5B 5-Port Ethernet Switch greatly reduces installation costs by eliminating the need and expense of running dedicated cables for each individual deployed device. NetWay series products are manufactured in the U.S.A., and backed by a lifetime warranty. For more information on Altronix’s extensive line of products, call toll free 1-888-258-7669, e-mail info@altronix.com or visit www.altronix.com. For more information about Altronix, contact us!